Asakusa's Sanja Matsuri is not only one of the largest festivals in Japan, but also one of the wildest. In this article, we cover four tips from locals to help visitors safely navigate their way through this three day festival in the Asakusa area. The third weekend in May is a special time of year for Tokyo's Asakusa area. This is the weekend of the Sanja Matsuri, one of the largest events in the Japanese festival calendar. In 2018, it will be held from Friday, May 18th, to Sunday, May 20th. Each year roughly 1.5 million people from all across Japan and around the world come to Asakusa to take part in this 700 year old festival. That being said, with crowds like this, there are important things both first and repeat visitors should know. 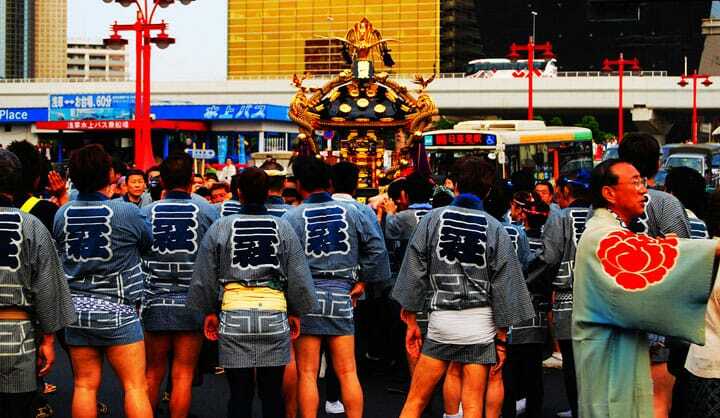 In this article, we share four important tips on how to really get the most out of your Sanja Matsuri experience, as provided by locals from the Asakusa area. The most important part of this festival are the mikoshi, or portable shrines. While seeing these elaborate miniature shrines during the day is spectacular, the sight of them at night during is a must too. During the Yomiya, the Festival Eve, which starts around 17:30 on the Friday night, you can enjoy the sight of the mikoshi along streets illuminated by paper lanterns and filled with traditional Japanese festival atmosphere. You may even find yourself feeling as though you've gone back in time during the Yomiya. The Yomiya is also somewhat less crowded than the daytime festivities, so it's a great time to visit for those that aren't very fond of crowds. The Asakusa area consists of 44 regions or town councils, each of which have their own distinct mikoshi and hanten (traditional short jackets). Originally all the hanten were made from indigo dyed fabrics, but the color variations and patterns to each district's costumes have changed over the years. Depending on the council, there are special times where there may only be female mikoshi bearers (called Onna Mikoshi in Japanese) as well, who may have different costumes even from the men too. Those interested in Japanese fashion and design are sure to enjoy seeing the differences in costumes for sure. The Sanja Matsuri is a religious event underneath it all - its original intent was to pray for a bountiful harvest, and as such, traditionally speaking, only shrine or temple members are permitted to carry the mikoshi. They are the only ones permitted to wear the hanten of that mikoshi and council region as well. However, if you will be attending the festival with your children, they might be able to take part. The Kids' Mikoshi, a parade of smaller mikoshi from the different regions that children can carry starts around noon on the Saturday. Please note though, that children will need to be dressed in traditional festival garb to take part; these costume sets for children are sold at several shops in the Asakusa area and generally cost about 5000 yen. However, for floats (not the mikoshi themselves), you may also be able to participate dressed as you are. The rules vary by council, so be sure to ask the person in charge (typically a man in a hanten with a special sash), if you can participate. Keep this helpful Japanese phrase in mind: Kono ko sannka dekimasuka? (Kohno koh sankah dekeymas kah? ), which means "Can our child take part?" beforehand. Oftentimes, the children that participate are given a small gift of candy afterwards to reward them for their efforts. Please note though, the floats are only for children up to nine years old and of a certain height, while the actual mikoshi are only allowed to be carried by people junior high age and over in proper hanten uniforms. Make sure to speak to someone in charge before attempting to join in. With so many people coming to the area for sightseeing and the festival itself, there are bound to be lines around the block at each restaurant and cafe in the area. Long waiting times are to be expected, so choosing what you want to eat early is one good piece of advice, but another is to sample the wares sold at the yatai, or food stands, that will line the Sensoji Temple area. These yatai are concentrated on Nishisando Dori (to the west of the temple) and Okuyama Omairi Dori (behind the temple complex). Popular festival foods like yakisoba and colorful chocolate covered bananas, takoyaki, and of course cotton candy will be available, as well as some unique dishes made by local shops too. Some stores even have special Sanja Matsuri menus too, so keep an eye out for these as well! Non-food shops also get into the Sanja Matsuri spirit too, with many having special sales or festival related, limited edition goods available too. If you're looking for a truly unique souvenir of your time in Asakusa, this is a good time to shop. Asakusa is a very popular sightseeing spot at the best of times, but during the festival weekend, it becomes extremely crowded and can be difficult to move through. To avoid any unnecessary anguish if you are visiting during the Sanja Matsuri, please keep the following tips in mind. Dress casually in weather appropriate layers, and wear comfortable, flat footwear. High heels should definitely be avoided as you'll be on your feet for a very long time during the festivities. Leave large backpacks, rolling suitcases, and other big, bulky items at your accommodations. Not only is there neither the space nor the storage to secure these during the festival, they can also be a nuisance or attract pickpockets as well. Properly dispose of any garbage that you may be carrying about in the appropriate bins or bring it in a plastic bag back to your accommodation with you. As the day progresses, many people will start to drink and fights will sometimes break out between drunken revelers. Avoid these spots, and use your common sense when walking about. If you keep these four festival tips and safety guidelines in mind, you're sure to have a blast at the Sanja Matsuri. Make sure to come out and see this wild, massive event for yourself!